With a name that encapsulates all of the grandeur of Egypt’s ancient past, the Valley of the Kings is one of the country’s most popular tourist destinations. It’s located on the west bank of the Nile, directly across the river from the ancient city of Thebes (now known as Luxor). Geographically, the valley is unremarkable; but beneath its barren surface lie more than 60 rock-cut tombs, created between the 16th and 11th centuries BC to house the deceased pharaohs of the New Kingdom. The valley comprises two distinct arms — the West Valley and the East Valley. The majority of the tombs are located in the latter arm. Although almost all of them were looted in antiquity, the murals and hieroglyphs that cover the walls of the royal tombs provide an invaluable insight into the funerary rituals and beliefs of the Ancient Egyptians. After years of extensive study, most historians believe that the Valley of the Kings was used as a royal burial ground from approximately 1539 BC to 1075 BC — a period of almost 500 years. The first tomb to be carved here was that of the pharaoh Thutmose I, while the last royal tomb is thought to be that of Ramesses XI. It is uncertain why Thutmose I chose the valley as the site of his new necropolis. Some Egyptologists suggest that he was inspired by the proximity of al-Qurn, a peak believed to be sacred to the goddesses Hathor and Meretseger, and whose shape echoes that of the Old Kingdom pyramids. The valley’s isolated location is also likely to have been appealing, making it easier to guard the tombs against potential raiders. Despite its name, the Valley of the Kings was not populated exclusively by pharaohs. In fact, the majority of its tombs belonged to favored nobles and members of the royal family (although the pharaohs’ wives would have been buried in the nearby Valley of the Queens after construction began there in around 1301 BC). Tombs in both valleys would have been constructed and decorated by skilled workers living in the nearby village of Deir el-Medina. Such was the beauty of these decorations that the tombs have been a focus for tourism for thousands of years. Inscriptions left by the Ancient Greeks and Romans can be seen in several of the tombs, especially that of Ramesses VI (KV9) which has over 1,000 examples of ancient graffiti. More recently, the tombs have been the subject of extensive exploration and excavation. In the 18th century, Napoleon commissioned detailed maps of the Valley of the Kings and its various tombs. Explorers continued to unveil new burial places throughout the 19th century, until American explorer Theodore M. Davis declared the site fully excavated in 1912. He was proven wrong in 1922, however, when British archaeologist Howard Carter led the expedition that uncovered the tomb of Tutankhamun. Although Tutankhamun himself was a relatively minor pharaoh, the incredible riches found within his tomb made this one of the most famous archaeological discoveries of all time. The Valley of the Kings was established as a UNESCO World Heritage Site in 1979 along with the rest of the Theban Necropolis, and continues to be the subject of ongoing archaeological exploration. Today, only 18 of the valley’s 63 tombs can be visited by the public, and they are rarely open at the same time. Instead, the authorities rotate which ones are open in order to try and mitigate the damaging effects of mass tourism (including increased carbon dioxide levels, friction and humidity). In several tombs, the murals are protected by dehumidifiers and glass screens; while others are now equipped with electric lighting. Of all the tombs in the Valley of the Kings, the most popular is still that of Tutankhamun (KV62). Although it is relatively small and has since been stripped of most of its treasures, it still houses the boy king’s mummy, encased in a gilded wooden sarcophagus. Other highlights include the tomb of Ramesses VI (KV9) and Tuthmose III (KV34). The former is one of the valley’s largest and most sophisticated tombs, and is famous for its detailed decorations which depict the complete text of the netherworld Book of Caverns. The latter is the oldest tomb open to visitors and dates back to approximately 1450 BC. The vestibule mural depicts no fewer than 741 Egyptian divinities, while the burial chamber includes a beautiful sarcophagus made out of red quartzite. Make sure to plan a visit to the Egyptian Museum in Cairo to see the treasures that have been removed from the Valley of the Kings for their own protection. These include most of the mummies, and Tutankhamun’s iconic golden death mask. Note that several items from Tutankhamun’s priceless cache have recently been moved to the new Grand Egyptian Museum near the Giza Pyramid Complex - including his magnificent funerary chariot. There are several ways to visit the Valley of the Kings. Independent travelers can hire a taxi from Luxor or from the West Bank ferry terminal to take them on a full day tour of West Bank sites including the Valley of the Kings, the Valley of the Queens and the Deir al-Bahri temple complex. If you’re feeling fit, hiring a bicycle is another popular option — but be aware that the road up to the Valley of the Kings is steep, dusty and hot. It is also possible to hike into the Valley of the Kings from Deir al-Bahri or Deir el-Medina, a short but challenging route that affords spectacular views of the Theban landscape. Perhaps the easiest way to visit is with one of the countless full or half-day tours advertised in Luxor. Memphis Tours offer an excellent four-hour excursion to the Valley of the Kings, the Collossi of Memnon and Hatshepsut Temple, with prices including air-conditioned transport, an English-speaking Egyptologist guide, all of your entrance fees and bottled water. Start your visit at the Visitors Centre, where a model of the valley and a movie about Carter’s discovery of the tomb of Tutankhamun give an overview of what to expect inside the tombs themselves. There is a small electric train between the Visitors Centre and the tombs, which saves you a hot and dusty walk in exchange for a minimal fee. Be aware that there is little shade in the valley, and temperatures can be scorching (especially in summer). Make sure to dress coolly and bring plenty of sunscreen and water. There’s no point in bringing a camera as photography is strictly forbidden — but a torch can help you to see better inside the unlit tombs. Tickets are priced at 80 EGP (Egyptian pounds) per person, with a concessional fee of 40 EGP for students. This includes entry to three tombs (whichever ones are open on the day). 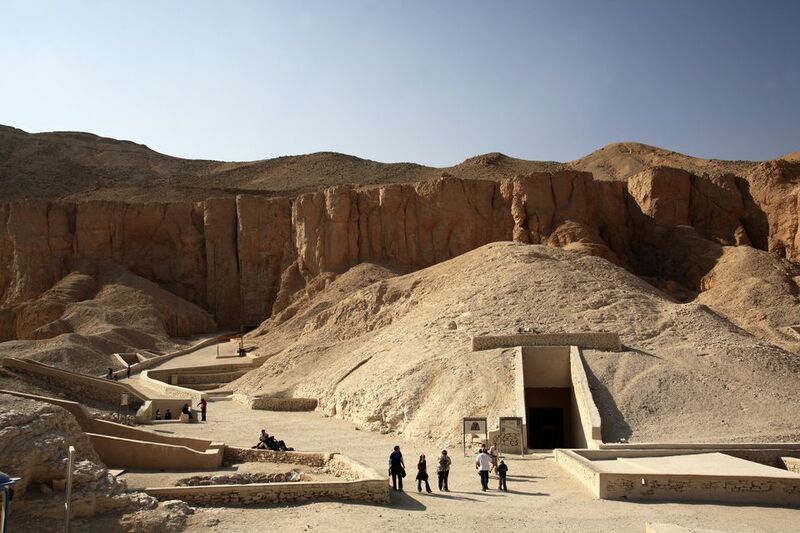 You’ll need a separate ticket to visit the West Valley’s single open tomb, KV23, which belonged to the pharaoh Ay. Similarly, Tutankhamun’s tomb is not included in the regular ticket price. You can buy a ticket for his tomb for 100 EGP per person, or 50 EGP per student. In the past, as many as 5,000 tourists visited the Valley of the Kings every day, and long queues were part of the experience. However, recent instability in Egypt has seen a dramatic drop in tourism and the tombs are likely to be less crowded as a result.